Although most of the websites over internet are in English language, but sometime we do come across website or blog which are in different language. When website or blog website language is not known to us, it become frustrating reading website pages which are written in a language which we do not know. I found two solutions for this issue, both solution are simple but first one is quick and easy. 1: Install Translate This! : This is Firefox Add-on, install this add-on if you frequently come across site which are neither in English language nor in your local language. - Open Firefox, now either type [about:Add-ons] without brackets in address bar or go to Tools > Add-ons. - Search for Translate This!, once it is found, click Install button next to it. - This will download and install it. 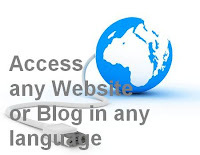 - Once this website or blog language translator tool is installed, restart your browser. - Now make sure, Add-on bar is enabled, by default it is not. - How to enable Add-on bar: In your Firefox, go to View menu > Toolbar > check mark Add-on bar. - Now access any website and click Translate This icon at the bottom of the page in left hand side, this will open up Google Translator, select the language into which you want to convert this page and click search icon (blue color), soon the page language will be converted. 2: Google Translate: This is manual way of converting any website's language for reading purpose. - Type or paste website / blog address you want to convert in left hand side box. - This utility does not change any website or blogs language permanently, they just convert the page temporary so users across the world can read them in their native language. - This solution is very helpful when website does not language translator tool installed.